We'll start by looking at a code sample, then we'll discuss the syntax. 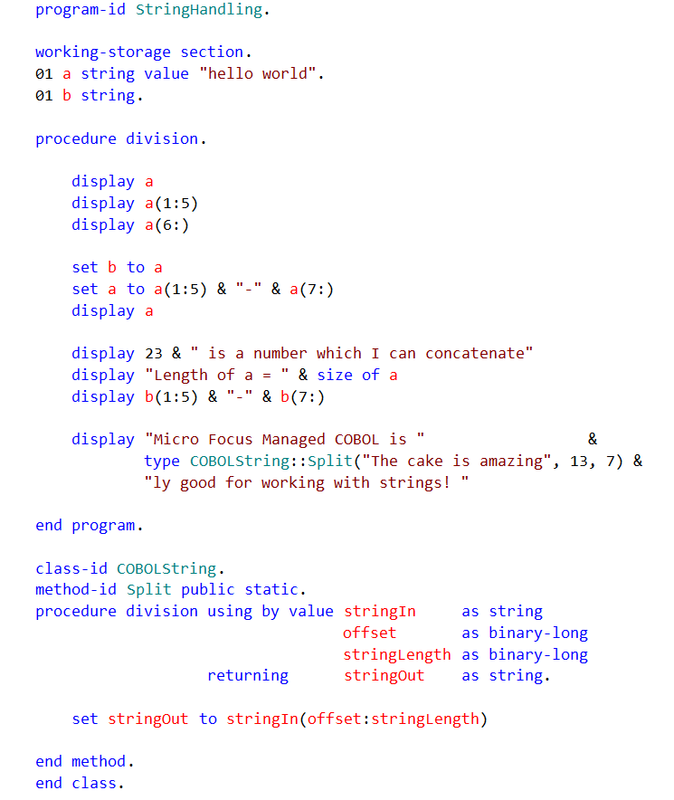 Micro Focus Managed COBOL is amazingly good for working with strings! To do this with C# or Java you would have to use a substring method on the string class. To do this with C# or Java you would have to use a length method on the string class. String concatenation is easy in COBOL using the & operator. quoted string constants eg a & "-"
non-string types eg 23 & " is a number"
and most impressively a combination of the above! NB All the sample code above will compile to .NET or JVM. For an overview of .NET COBOL & JVM COBOL please see "Managed COBOL - An Overview". set n to size of myString.